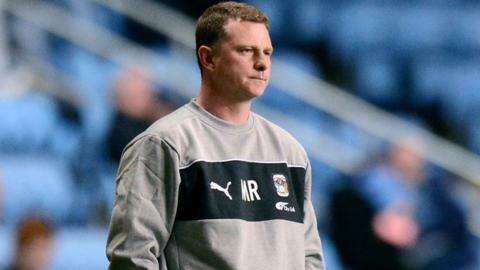 Coventry boss Mark Robins is waiting for his treatment room to clear ahead of a testing assignment of four away games out of their next five matches. Winger David Bell is still out, while loan man Conor Henderson and Conor Thomas both have knee injuries. And William Edjenguele (hip), Gary McSheffrey (foot) and Cody McDonald (knee) all missed Saturday's 1-0 important home win over Bournemouth. "We've got five or six which who are struggling at the moment," said Robins. "Some of the injuries are clearing up. We've got situations where players have picked up little knocks and then they have gone on a bit, and then got a little bit worse. "One or two of those will be back soon but it is never easy to tell. William, Gary and Cody are still struggling." Although insistent that he intends to pick a strong team for Tuesday night's Johnstone's Paint Trophy tie at York, Robins also has half an eye on Saturday's trip to Swindon. After helping his team climb out of the bottom four for the first time since he took over thanks to three points against Bournemouth on Saturday, Robins knows his team face a daunting October. After the following weekend's home game against Notts County, the Sky Blues then face two away matches in London in the space of four days at Brentford and Leyton Orient. Of all his missing players, Thomas, who has only made one substitute appearance so far this season, is still some weeks away from a return. "He is still on the treatment table at the moment," said Robins. "It is a blow because I have seen him play and he would definitely offer us something."